The film tells the story of blacksmith Lucian (Michael Sheen), who was the first werewolf able to take human form and to be called a Lycan. Viktor (Bill Nighy), the ruthless elder of the vampires, takes him home after killing his werewolf mother. Viktor envisions a race of werewolf slaves for his vampire clan that, conceivably, could keep guard during the daytime hours and toil for the vampires. As Lucian grows up at Viktor's home, his young daughter, Sonja (Rhona Mitra), develops an attraction to the young Lycan. Lucian becomes fond of Sonja as well. It is revealed that Viktor has a relationship with the human population of the area, whereupon he agrees to protect them from the wild werewolves that roam the countryside in exchange for a tithe. As a collection of human nobles comes to meet with the vampire council for protection from the werewolves in exchange for this aforementioned tithe, Sonja goes out to guard them. Lucian hears the werewolves near Sonja and steals a horse and sword from a nearby Death Dealer. Wild werewolves proceed to attack and kill the nobles, causing Lucian to engage in a battle with them. When Lucian takes off his collar and changes into a Lycan in order to protect Sonja, the wild werewolves back down to his howl and leave before Lucian is shot down by Viktor's men. Viktor, despite grudging acknowledgment that Lucian has saved his daughter, notes that Lucian has still transgressed the laws of the coven by taking off the collar that keeps him in check (its inward-pointing spikes are designed to kill him if he changes into a Lycan) and feels betrayed by what he thinks of as his favorite pet. Subsequently, he locks Lucian away after having him whipped thirty times with a three-pronged chain-bladed whip. With the help of the scheming vampire Andreas Tanis (who knows about Lucian's and Sonja's secret love), Tanis and Sonja orchestrate Lucian's release. In exchange (and to ensure he doesn't tell Viktor), Sonja promises Tannis her seat on the vampire Council. Lucian escapes, kills several of the Vampires and begins to liberate the other Lycans from their unfair imprisonment. The guards are alerted and start to slaughter the escaping Lycans. Sonja remains behind but when Viktor discovers that she has had a forbidden relationship with Lucian, he imprisons her. Meanwhile, Lucian and some of the freed Lycans roam the nearby countryside recruiting many of the labourers of the human nobles to their fight for freedom from both the nobles and the vampires. Lucian also travels to a cavernous location that is teeming with werewolves in attempt to make contact with them. Back at the fortress, the Vampire nobles are outraged at the escape and growing chaos with the Lycans, demanding that Viktor brings Lucian back. Viktor assures them that Lucian will return on his own since Viktor has something that Lucian wants (Sonja). Lucian and his followers are waiting in the forest for Sonja to join them, as they had previously agreed. However, instead Lucian learns about Sonja's imprisonment from one of Sonja's attendants and sets out to rescue her. Lucian orders his Lycan followers to wait for now, but be prepared to attack if he does not return. Lucian successfully rescues Sonja from the fortress but on their way out they are attacked by the Death Dealers. Viktor is also involved in the chase and when it comes to the fight, it is Sonja who confronts Viktor. When Sonja discloses to him that she is pregnant with Lucian's child, Viktor overpowers her with a knife to the throat and imprisons both her and Lucian with renewed hatred. Sonja is sentenced to death for her crime against the coven at a trial presided over by her father and the Council. After being chained and whipped again, Lucian is forced to witness Sonja's death, in which she is burned to death by overexposure to sunlight. Lucian, deeply exhausted, saddened and shaken after witnessing the death of his love, passes out. Lucian awakens when Viktor comes in to view his now deceased daughter. As Viktor sadly removes the pendant necklace he had given Sonja, an enraged Lucian transforms and overpowers Viktor. Lucian takes Sonja's pendant and escapes out of a window. The escape is stopped at the castle walls by Death Dealers as Lucian is repeatedly shot with crossbows. With a thunderous howl, Lucian summons the freed Lycans and the wild werewolves, who attack the coven and overwhelm it after a fierce battle, killing all the defending vampires and Death Dealers. The Vampire Council members are also killed along with their aides, lesser vampire nobles and councilors while trying to flee the council chamber. Viktor unsuccessfully tries to escape Lucian and they battle their way to the catacombs. The fight continues back and forth until Lucian knocks Viktor down a well. Lucian tears at chains hanging from above, making a hole in the roof and allowing sunlight in and cornering an enraged Viktor in the darkness. Viktor's 'final' words attest to his regret at not having killed Lucian the moment he was born, to which Lucian sarcastically agrees before forcing his sword through Viktor's mouth and head and letting the body fall into the water below. Lucian emerges to the courtyard which is ringed with the surviving Lycans and freed slaves. He declares this victory as only the beginning of what will surely be a war between the races, one bred for slavery and the other born into privilege. In one of the closing scenes we see Tanis leading a very alive Viktor, who survived due to his status as an Elder, into a hibernation chamber on a boat. 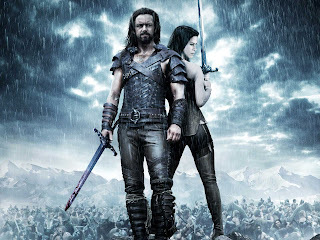 The film ends with the opening scene of the first Underworld, with the audio from the scene where Kraven tells Selene that it was Viktor who murdered her family, rather than the Lycans. That Viktor spared her because she reminded him of Sonja, the daughter he condemned to death. Then Selene replies to Kraven, "Lies!"